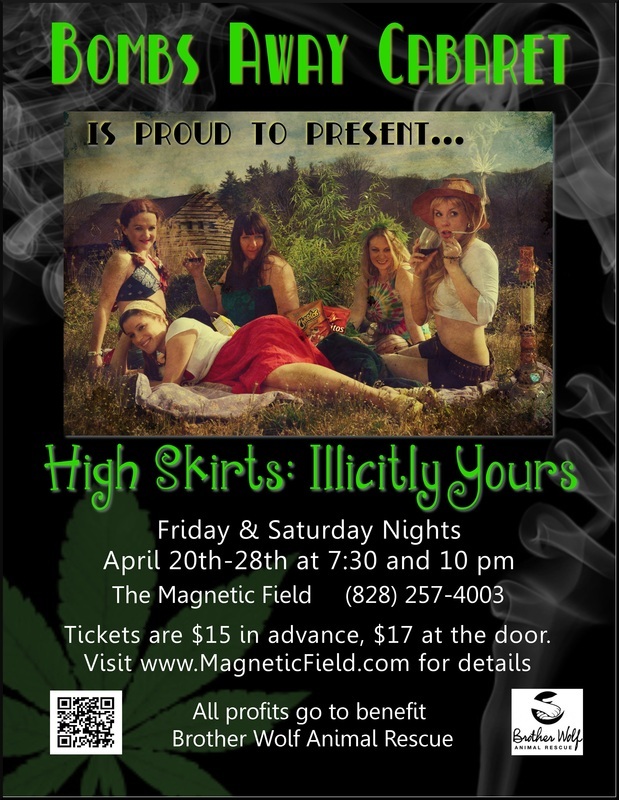 High Skirts: Illicitly Yours - Bombs Away Cabaret! Having narrowly avoided foreclosure on several occasions, Bombs Away Cabaret is no stranger to garter belt-tightening. So, when troupe member Iona Traylor finds out that her family farm is about to be bought-out and demolished to build a strip mall, the girls are quick to pack up their corsets and head to the country to see if their feminine wiles can save the day. But will the good people of Hollar, West Virginia be entertained by the burlesque stylings of an uppity fallen opera star, a bitter mail-order bride, and a very confused fundamentalist Mormon? This production featured Lotta Hart, Ivana Stabobitch, Iona Traylor, Claudette Clevage, Ophelia Bottome, Phil D. Honeypot, Robin D. Cradle, and accomplished local actors Darren Marshall and Chris Brunton. Over $3,200 raised for Brother Wolf Animal Rescue! Ivana Stabobitch singing "Specialist Spinach"